If you are looking for something completely different for your next party Jump Zone is the place to come. Lots of different packages available starting from only €14.50 per person. When you visit us at Jump Zone be prepared for a unique and cutting-edge experience at our 35,000 square foot facility. Jump Zone is the first of its kind indoor trampoline park not only in Ireland but in the whole of Europe. Jump Zone is suitable for people of all ages, from children over 5 years to adults of 55+ years, for 1 person or for a group you will have the opportunity to exercise and enjoy themselves in a family-friendly environment. You can free jump or do tricks or partake in some of the main activities on offer, including Aerobics, Foam pit and Dodgeball (subject to availability), on our custom made trampolines adjoining the floors and walls. When you visit our new facility in Santry be prepared to be thrilled on our main jump arena. With over 45 interconnected trampolines and our recently added Jump Boxes you are sure to be thrilled. Now’s your chance to be an NBA star with a difference. Three 5 meter trampoline lanes lead to our reinforced basketball nets. Fly through the air and slam dunk, NBA style. Featuring our purpose built trampoline Dodgeball Court measuring almost 3000sq.ft. We have also adding a new Long Lane Dodgeball Court. If you come with a birthday party you will enjoy private games with your guests. If you come alone or with some friends, you will challenge each other and participants to Dodge Duck, Dip Dive and Dodge, let the games begin. Our foam pit is one of our most popular attractions at Jump Zone. Four long lane trampolines lead into a sea of foam cubes. The pit stands almost 6 foot off the ground to house almost 12,000 blocks of foam. Participants can practice flips and tricks with the foam providing a softer landing. If you are looking for something completely different for your next party Jump Zone is the place to come. We can accommodate parties from 10 to 50+ people. Best of all, we take care of everything from set up to clean up. Please note – No food is available with this package and no outside food is permitted. ​​​​​​Cost – €14.50 per person (Fri, Sat, Sun & during mid-term breaks & holidays) €13.50 per person off peak (Tues, Wed, Thurs) ** Minimum numbers for a birthday party is 10. 2 large slices of pizza per person > additional pizzas can be ordered at €12 per pizza. Other food options available on request (a supplement may be charged). Cost – €18.00 per person (Fri, Sat, Sun & during mid-term breaks & holidays) €16.00 per person off peak (Tues, Wed, Thurs)** Minimum numbers for a birthday party is 10. 2 large slices of pizza per person > additional pizzas can be ordered at €12 per pizza. Other food options available on request (a supplement may be charged) . Cost – €21.00 per person (Fri, Sat, Sun & during mid -erm breaks & holidays) €19.00 per person off peak (Tues, Wed, Thurs) ** Minimum numbers for a birthday party is 10. Looking for something different for your next party location? Why not book one of our evening party slots when the park is getting a bit quieter. We will allocate a party host who will bring you around the park and give you allocated time slots for each attraction including private games of Dodgeball, access to the Foam Pit, some shots at our trampoline Basketball and finally play some games on our main court. You can also personalise your party, just tell the host if you would like to stay longer at any attraction and we will do our best to accommodate you. Jump Zone has redefined Dodgeball in this part of the world. One game and you’ll be hooked. The old game of Dodgeball may have been a blast but this new style will knock you off your feet, literally. Why not rent the Dodgeball court for an hour with a group of friends or colleagues (subject to availability) for €220.00*. Trampoline Dodgeball is the ideal activity to break up the monotony of your working week. When you book we will provide a referee and trampoline grip socks to all participants (can accommodate any number from 8 to 20+). Let the games begin!! Bring your School / Sports group to the Jump Zone indoor trampoline park for fun and excitement that you will experience nowhere else. Jump Zone is the perfect place for schools, youth groups, scouts, clubs, teams, etc. Enjoy jumping on the main court, access to the Foam pit and our Basketball lanes, why not have a few games of Dodgeball or battle it out in the Battle Zone!! The entire facility or Dodgeball Court can be rented for the larger group or if you are looking for an adult party with a difference then look no further than Jump Zone. When you book the entire facility refreshments are included and our party hosts will run a mini Dodgeball competition and interactive games. The newest sensation in Corporate entertainment – Are you looking for a great way to stimulate your employees? If so why not take them out of the office and visit us in Jump Zone Santry for an exciting experience that will challenge, motivate and help build team dynamics. All concerned will get to enjoy a fun and unique adventure like no other. Corporate team building events can be scheduled anytime subject to availability. Tailored packages can be created to suit your needs with prices available on request. One of the most popular options is to rent the Dodgeball Court for 1 hour €220 for up to 20 participants. Each participant over 20 would be charged €11pp. 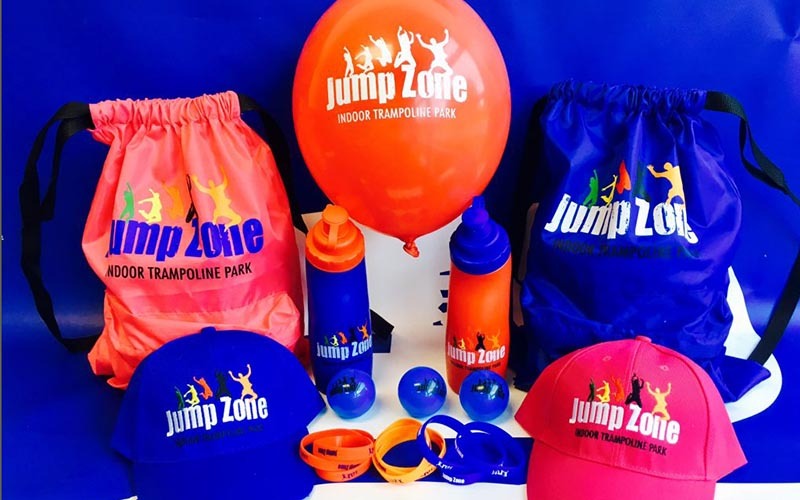 Please note that you must be over 5 years of age to use the trampolines at Jump Zone and payment is required when booking – To avoid disappointment we strongly recommend that you book in advance. Jump Zone grip socks are now compulsory. Jump sessions commence on the hour and every half hour for an hour. 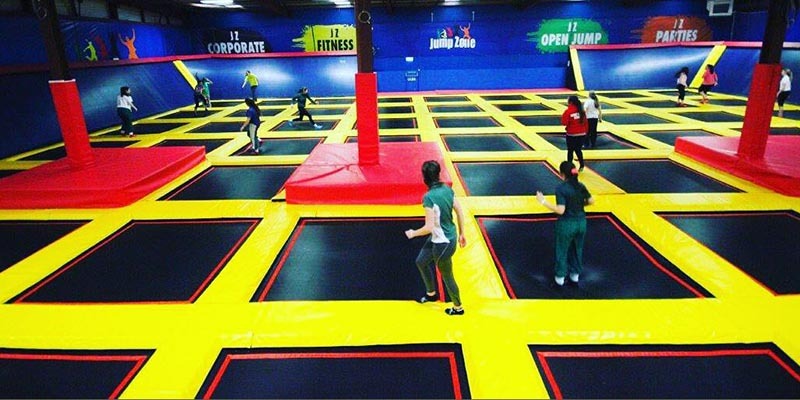 Jump Zone is Ireland’s first and Europe’s largest indoor trampoline park. 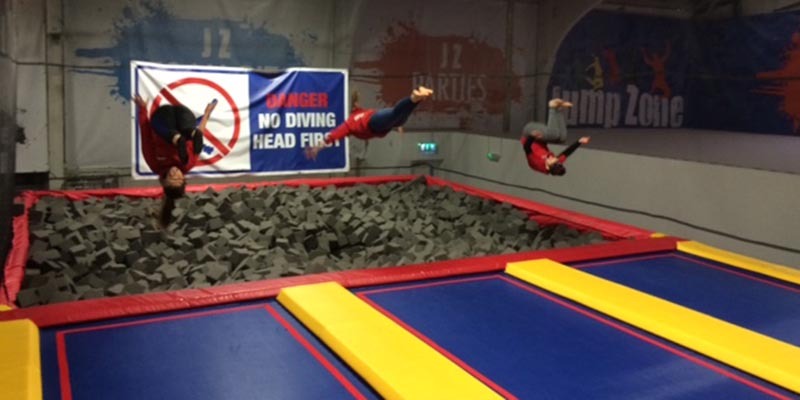 At Jump Zone Santry you don’t need to be with a party you can jump on your own or with one, two or a group of your friends. With over 14,000 sq ft of trampolines, you can literally bounce off the walls. Open jump sessions start on the hour and half hour typically for an hour but you can book a two-hour session if you feel up to it. Why not join in a few games of Dodgeball or practice some flips. If you have a large group (from 10 to 20 people) why not rent the Dodgeball Court for an hour (€220). We provide the referee and jump socks, you just have to turn up! !